Fuller Hall Recreation Center, Webster City Municipal Outdoor Swimming Pool, youth recreational leagues, adult recreational leagues, all city-owned parks, Brewer Creek Recreational Trail, Boone River Recreational Trail, Graceland Cemetery, city right-of-way areas, city-owned properties, and assisting with community wide special events. 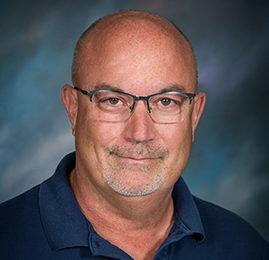 In addition to being the Recreation & Public Grounds Director, Kent also serves as the liaison for the Webster City Airport Commission, and represents the City Manager as needed. Kent was born in Iowa Falls and moved to Webster City prior to starting grade school. He started working for the City of Webster City in 1980 as a part-time employee while attending college full-time. In 1987, Kent became a full-time employee with the City and has held his current position since 1995. Kent is also an Adjunct Professor with Iowa Central Community College. He has an Associate of Arts degree from Iowa Central Community college; Bachelor of Arts degree from the University of Northern Iowa; Master of Arts degree from the University of Northern Iowa, and an Ed.S. degree in Administration from Drake University. ​Kent has also graduated from the​ Iowa Certified Public Manager Program through the Center of Professional Studies of Drake University. Kent and his wife, Becky, have three children. In his spare time, he enjoys spending time with his family and participating in triathlons (including the Ironman), riding on RAGBRAI, as well as, restoring an old house.